leading to it. When it came time for the hearing, however, William J. Feaga, Clerk of the Court, refused to open the court room. Feaga declared that he had agreed with Commissioner Anderson to grant the use of the room providing the latter would say "nothing about it." 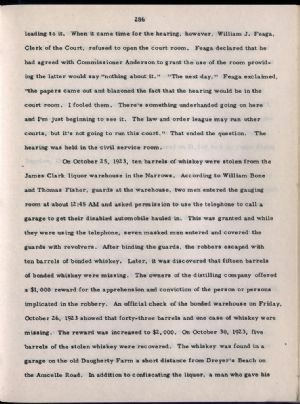 "The next day," Feaga exclaimed, "the papers came out and blazoned the fact that the hearing would be in the court room. I fooled them. There's something underhanded going on here and I'm just beginning to see it. The law and order league may run other courts, but it's not going to run this court." That ended the question. The hearing was held in the civil service room.